How about the new USMC M1A1 commanders cupola? Thank you Mike. I like the separate rear door option. Anyways to work down the unit cost are always appreciated also. I am holding off to better understand the fit up. Thanks for checking this Eric. Interested in what measurements and the fit looks like? Nov 2, 2018 photo of KY NG on the interstate. The 2 Tricon sets are up! One set with just doors and floor and another with walls and ceiling. Great effort all along the way mate! Congrats to your achievements, always cool to look in here what the guys n u come up with! It would have been $90 for the whole container with separate doors. Over $100 for it as a kit with separate walls, doors, ceiling and floor but now only $35 for 4 doors and a floor. I can provide the walls and ceiling separately but unfortunately that costs $60. $90 a piece or $90 for a set of three? Maybe you should reconsider letting the buyer supply the side and roof panels from one of the popular plastic kits??? Congrats on the success of your site. I hope it is proving worthwhile & successful for you in other ways as well. I think I also congratulated you way back when this site passed 100K hits. I uploaded it but forgot to put it up for sale. I need to add a second set to it. With just 2 cases the minimum price is $7.50. Hopefully adding a second set would make it a bit more worthwhile without adding too much cost. I have also uploaded a test of the Tricon container and, in the current configuration, it would cost about $90. I'll see if flat-packing it reduces the cost. Unfortunately that may lead to problems with machine space. I'm also surprised that we've made it to nearly 50 pages! When I first started the thread I never thought it'd get this long. With 1,219 (currently) replies and over a quarter-million views, I think this might be the second longest thread on Armorama! What ever happened to the M14 rifle case for the M48. I didn't see it uploaded. Did I miss it? Still have more work to do. I need to find the best way to arrange the container so it doesn't cost too much. A BIG TRUMBS UP TO YOU on the Tricon! Please let us know when they become available. I have an empty flatrack just waiting for some work to do. For the past few days I've been working on the Tricon container. Instead of just a side, some doors and floor I've done up the whole container. What was inside the "office"? A table, a chair, a notebook? Typically a file cabinet a field desk & couple fold up chairs. On inside of doors was the Up/Down roster which gave status of each AAV in platoon (land/water/turret/comm) on one door and key board on other. Also all the brooms to sweep the ramp. Tight space kept it from being the "hang-out" - well that and Gunny (platoon Sgt) of course. Hi Michael, would you be able to do a triple T45 rocket launcher assembly and separate rockets in 1/35? I see a double in 1/56 scale already. So if we were then to do a double door TRICON the same 6'-6" x 8' endwall (with doors) would work for both ends. We would only be asking Mike to design one endwall and one floor piece! A complete set of three Tricons would require a total of six endwalls with doors and three base plates! Been hunting high & low for these! Such a simple item and they're everywhere yet none available in 1/35. 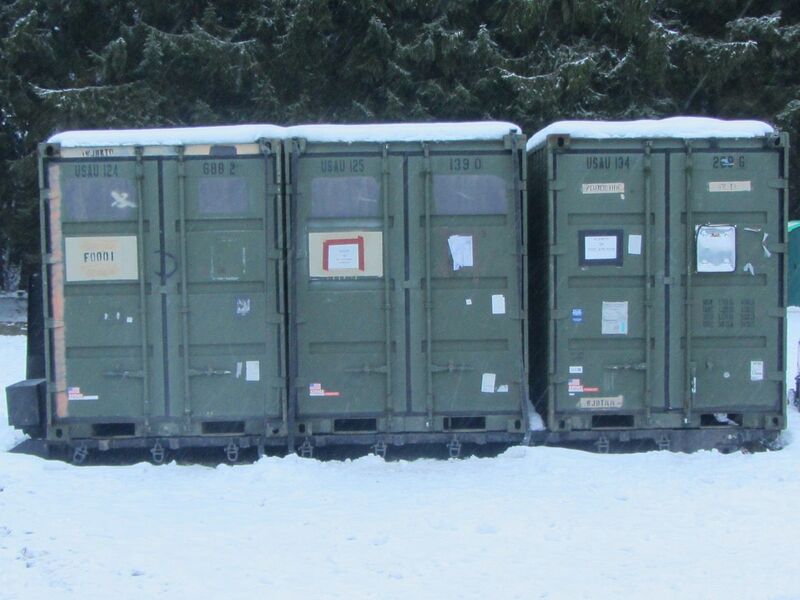 Each platoon had one on the ramp, it was the platoon "office." Take not that these Tricons have two double doors. Tricons can have up to 4 double doors. Interesting. Thank you for the link. 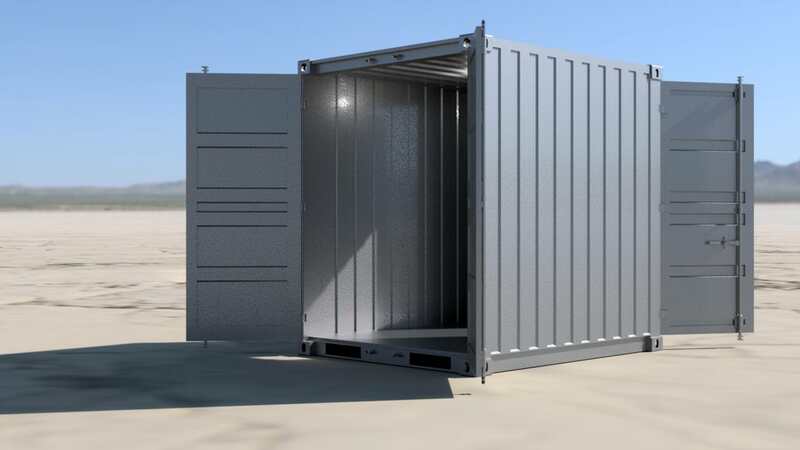 How about the door and back panels** for a standard ISO 6'-6" x 8' x 8' TRICON shipping container? We could get all other needed wall panels by cutting up a standard 20' container kit and with any luck one 20' container would yield enough stock to build 3 TRICONs. F.Y.I. 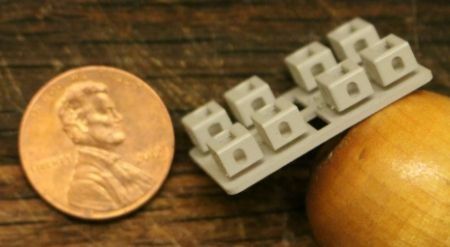 - You already have the container connector blocks digitally created and in your Shapeways catalog. ** Since fork lift access on these smaller containers is front to back rather than cross-ways you might have to do a dedicated floor panel as well. I second that! I have two A2's and an A1 that I have begun work on. Upper front control arms would be great! Proper covers below the battery box and the fuel tank would be welcomed as well. Thanks, I didn't realize they were the same ones.